RIPPER-VISION™ is a new approach to Jack the Ripper tours. Top of the range hand held projectors which emblazon five-foot images upon the dark streets and alleyways of Whitechapel.This brings not only top class images, but also film clips, moving images and overlapping pictures to leave you with an everlasting memorable experience. 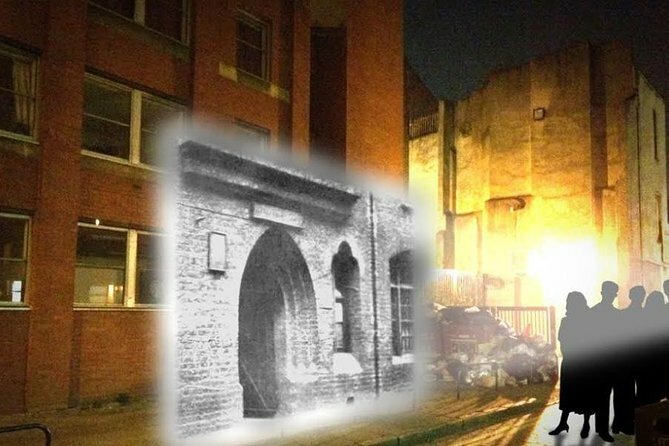 A Jack the Ripper Tour like no other, using our World Famous Rippervision, to show you the locations of the murders and the lives of the unfortunate victims! I do not like scary tours or anything to do with murders! But I booked this tour for my boyfriend. Even though I find this type of thing very scary, it was still fascinating and very well done. Our tour guide Mike/Mark was extremely knowledgeable, he ever wrote a book about it. It felt like a CSI episode, victorian style. I truly feel we couldn't have this tour from a better tour guide. We left talking about it and sharing it with friends. I would highly recommend this tour! Our tourguide Mick was a delight. You can tell he enjoys giving the tour. It was full of great facts, and being an avid Jack The Ripper "fan", I learned quite a bit that I hadnt read before. An added bonus was Mick's vast knowledge on serial killers in general. As someone who in interested in that type of thing as well, I love hearing about those facts. All in all, it was a great time to walk around White Chapel, and to see so many buildings that were around back when Jack was killing. Fantastic tour.Mick was so knowledgeable and informative and great fun.Would definitely recommended. Great guided tour around Whitechapel with Johnny. His knowledge and ability to keep us all enthralled was excellent. A very good guided tour. Excellent and interesting tour with a excellent guide! Highly recommended! We thought it was going to be cheesy, but it turned out to be fantastic! Would highly recommend to anyone. Loved this tour. Jamie was very enthusiastic and had lots of details about Jack the Ripper. It wasn't dark out due to it being summer so it was not dark enough for the projection. He had a large portfolio of pictures. The tour had good numbers and the tour guide was very knowledgeable and animated which kept us engaged. The Ripper vision was a nice added extra but slightly disappointing as in the advert I felt the projections would be bigger. missed it--I could not find the spot/meet up point. Vague directions--could have had better id on person/leader of group.